It is dishes like these that really transform a meal. I have to say that I am terribly conservative when it comes to veges and how I serve them. Apart from salads, where I quite happily experiment and mix it up, cooked veges in the winter tend to be simple and unadorned. Tonight I tried a recipe from Nigella's lastest book Nigella Express. On Violet's Pantry we have set a recipe from it once a fortnight to try. The first one was the 'Curry in a Hurry' which failed to appear on my blog as I was having terrible camera trouble and wiped it from my memory card! It was very nice though and it is always good to be prompted to try a recipe I probably wouldn't have tried otherwise. This time Minnie was responsible for the recipe choice and it is really delicious. Flipping easy and totally lifted our meal to a whole different level. 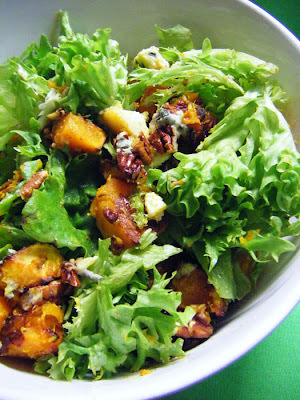 I naturally think of feta to pair with pumpkin, but if you are a blue cheese lover, you will LOVE this! I popped some lettuce with it, just because I wanted to get a bit of extra green into our dinner. My husband really enjoyed this, I will definitely make it again! 2. Halve the squash, leaving the skin on, and scoop out the seeds. Cut the squash into 2.5cm/1in cubes - you don't need to be precise, just keep the pieces uniformly small. 3. Place into a roasting tin and drizzle with the oil. Strip about four sprigs of thyme of their leaves (or use dried thyme) and sprinkle over the butternut squash. 4. Transfer to the oven and roast for about 30-45 minutes, or until tender. 5. Once out of the oven, remove the squash to a bowl. Scatter over the pecans and crumble over the cheese, stirring everything together gently. Season, to taste, with salt and freshly ground black pepper. 6. To serve, tear the remaining sprigs of thyme into small pieces and sprinkle over the top of the butternut squash mixture. That looks gorgeous! I'm so behind in the cookalongs - still need to make the 'curry in a hurry'! Hmm, have been admiring many of the different versions of this recipe I have seen. 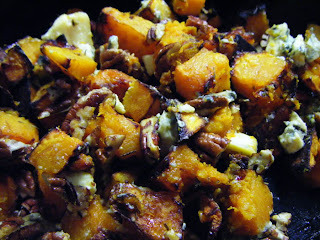 I love pumpkin and feta but would never have thought of pairing the pumpkin with blue cheese. I need to try this one, like the idea of adding lettuce to it for extra texture. Such a gorgeous recipe isn't it Linda. Your version looks fabulous.